Before her ordination, Maechee Ra-tri had a family with two daughters and three sons, and produced local Thai silk. She received 1st prize in silk production by the Ratri Thai Silk Co. 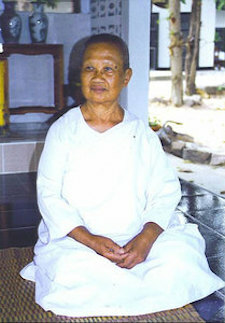 In 1982 she turned her interests towards Dhamma, and went to practice alone at Phu-Luang Mountain. Three years later she sought ordination as a Maechee.Then stone-by-stone, mixing cement, she built her own forest temple, and received other Maechees to come and practice. She has protected the forest and reforested 223 rai of land. From the start, Maechee Ra-tri helped to establish Mahapajapati College for nuns and lay women in Korat, Thailand. She donated 6 rai of land and built the water supply system for the college and nearby villages. Maechee Ra-tri supports the Dhamma and educational pursuits of Thai women and her center is open to Thai and international women practitioners. She attended a meeting in Tenrikyu, Japan and seminars at the National Education Council of Thailand in order to pursue her duties as a Maechee. Deep in her heart, she is proud to be born in Thailand, and to be a practitioner of Buddhism.